Across the U.S., acres of grass are being harvested for hay with a majority destined to be stored as bales for winter forage. This hay must be able to provide the necessary amount of protein and energy to fulfill the nutrient needs of the cattle that will consume it. While fertilization, weed pressure, and grass variety are what most consider, the most influential factor on nutrient content is stage of maturity at harvest. 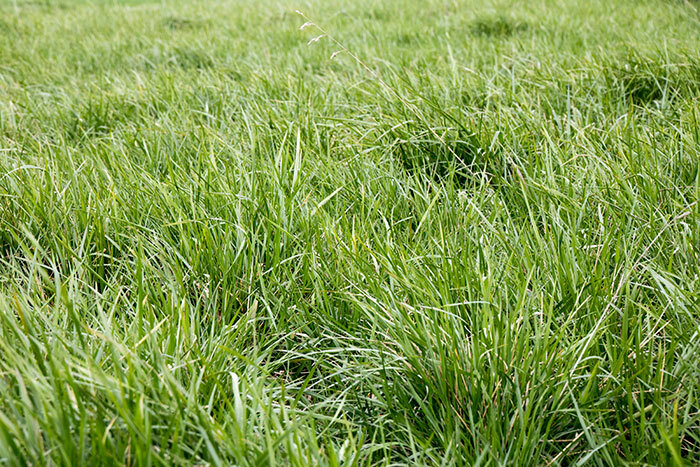 “If grass is cut when it’s young and leafy, a protein content of 13 to 15 percent could be expected,” explains Gary Bates, director of the University of Tennessee Beef and Forage Center, in a monthly article published on the UT Beef and Forage Center website. When a seedhead appears during the late-boot stage, the plant gradually produces a fibrous stem to extend the seedhead. During this process, the protein and energy level of the forage lessens, while the fiber content rises. Cutting at the late-boot stage produces high-quality hay. But when the plant reaches the seed stage, protein can gradually drop by 50 percent. When comparing tall fescue to other species such as orchardgrass and timothy, there was virtually no difference in protein and energy levels when cut at the same maturity. Aim for the late-boot stage. When seedheads appear, it’s time to cut. Even if the weather doesn’t cooperate, the late-boot stage is the goal. Add legumes. Legumes like white clover and alfalfa have high energy and protein levels. Mixing those species with grass will raise the nutrient content of the hay. “If you're going to go to the expense and effort to make hay, you might as well produce good quality hay,” says Bates. He also recommends submitting a sample to a lab after the hay is cut to have it analyzed for quality.